I woke up to the smell of bacon and the sound of street cleaners in Vail this morning. I went to the start in Avon briefly, then drove the route into the finish in Steamboat Springs to see the sprint finish from the VIP tent. I am now staying the night in Steamboat Springs at the good 'ol Holiday Inn. After an embarrassingly large breakfast at my hotel ( I was ready for someone to walk up to me and say, "I have never seen a women eat so much). I meandered out, with a warm cup of coffee and the cool morning breeze on my shoulders, up the lane to the Betty Ford Botanic Garden and Park. It was spectacular. Walking sans devices, I took mental snapshots in my mind of one of the most beautiful gardens I have ever seen in the world. It was spectacular and is now my top three park experiences alongside Butchart Gardens in Victoria, Canada, and strolling the Tuileries in Paris. I spent some time talking to the race Marshals and motorcycle support staff that keep the peloton safe on the road. I will write a future post about their duties. 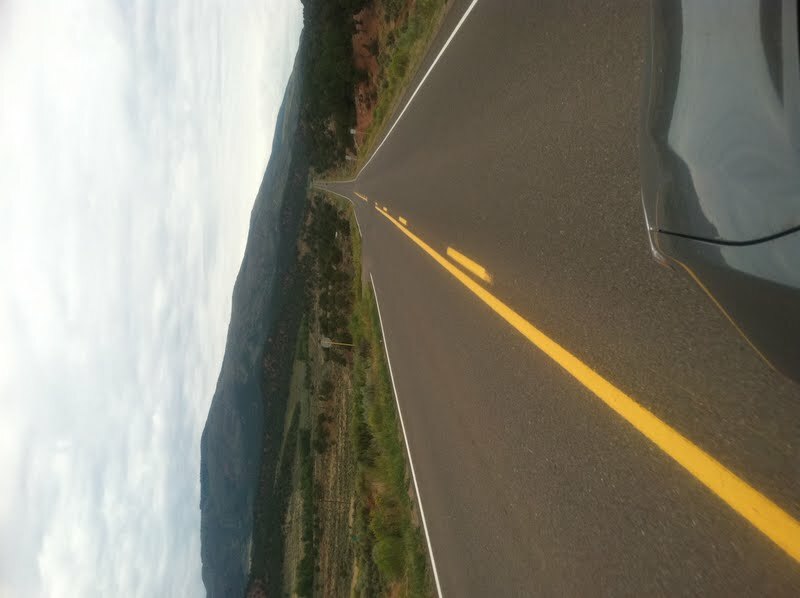 The drive from Avon to Steamboat was beautiful. I had fully expected long stretches with no people, but this was not the case. Even in the low population area of Colorado fans were out on the road in small and large groups. I preceded the race following the route on Hwy 131. Fans lined the roads in the open spaces and in the small towns. The Scout the Stage event was going on and many cyclists lined the road over the first climb. I followed the USPCC "staff" cars north through beautiful rolling landscape. I jumped on my around town bike after checking into my hotel and rode the crowded bike path into town. The crowds were huge in Steamboat and the volunteers were especially helpful and informed. 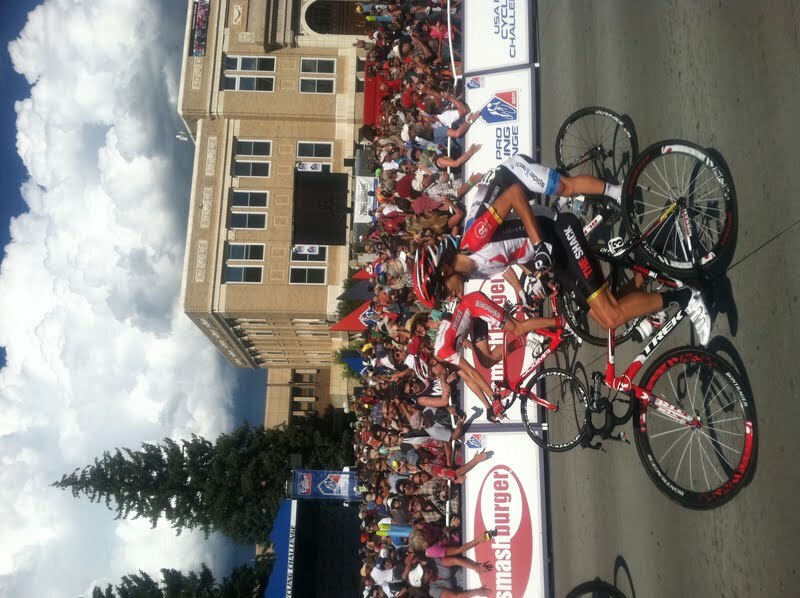 Steamboat did an impressive job as a host city for both a finish and a stage start. I overheard so many comments about how well organized it was. Today was a day to be excited for others. I had two friends riding the day in the yellow Mavic support vehicle cars from Avon to Steamboat. More friends were finally joining the fun for the first time as the weekend approached. I met Jason and Hope whom I had communicated with prior to the race through this blog. They had decided to go for VIP tickets and this was their big day to be located on the front barriers at the finish line to see the sprint go down. 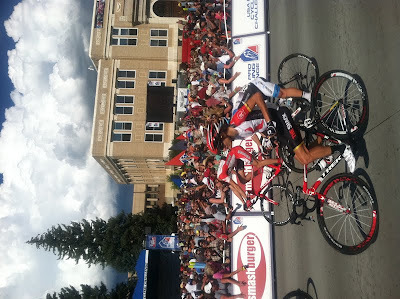 I too was lucky enough to be in the VIP tent for the finish in Steamboat (thank you Chris and Julie for the pass). Fun fun fun. I only wish I had more time there. The tent was huge and covered the long stretch just before the finish line. It was packed with people eating and drinking and having a good time. The shade was welcomed, so were the chairs to stand on to get a better view. 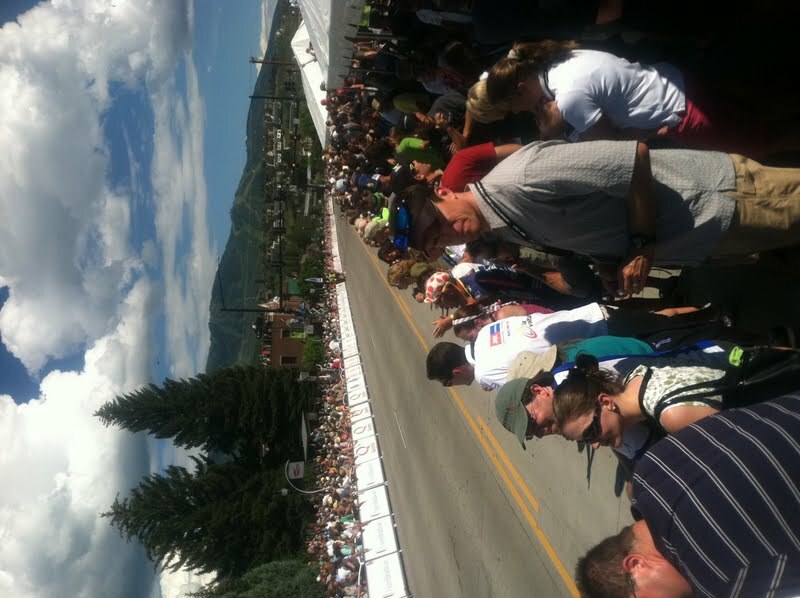 The crowds at the finish area in Steamboat were the real story of the day. Huge numbers of fans turned out for the event. They filled the courthouse park, the street sidewalks, the rooftops, the windows. The only time I have seen more people at a stage finish was in Paris and Bordeaux, France. Even the Time Trail in Los Angeles at the 2010 Tour of California did not visually seem as populated. I met a family from Wisconsin, who said the atmosphere in Steamboat Springs was very similar to the American Birkebeiner held in Wisconsin every year. We chatted how Thor Hushovd supposedly developed his fantastic descending skills on a bike because of his childhood spent on nordic skis. I suppose cycling notables are fans too. After my peaceful morning in the Betty Ford Alpine Garden in Vail, I met Dash and Paul Balaguer (a "cycling notable" from the previous nights Coors Classic reunion dinner in Vail) at the start line in Avon, where they awaited taking their co-pilot positions in two different Mavic support vehicles. I met Dirk Friel with Training Peaks, took some pictures, saw George Hincapie's brother and President of Hincapie Sports, Rich Hincapie. I recognized Jonathan Vaughters walking through the crowd unnoticed, and then off I went up the road to Steamboat Springs. In Steamboat, I happily entered the shaded VIP area where I met my friends Chris, Chris and Zach. Later I met Ron Keifel and Kevin Livingston as Frankie Andreu approached to ask for directions. I had dinner with the entire happy hard working crew from Bicycle Colorado (pretty please join), the Colorado bicycle advocacy group. At the Honey Stinger party in town, I received a tour into the office of Honey Stinger by Doug a marketing director, after I told him the story of being under a shelter tent in the rain on Independence Pass were 15 cyclists huddles together talking about how yummy Honey Stinger waffles were. Mike from Cottonwood Pass (Arizona) texted me earlier in the day to tell me he had just met Phil Liggett and Paul Sherwen, these two men still allude me at this #USAPRO. I would love to run into them again. Chris Rodriguez arranged four passes for us through Julie at Denver Athletic Club - thank you! many more pictures to be added, but I have to get going. Today I get to pick up my press pass!